It was co-developed by David Palmer, who introduced the very first professional massage chair in 1986. Nobody knows more about the proper functioning and design of massage chairs than David. 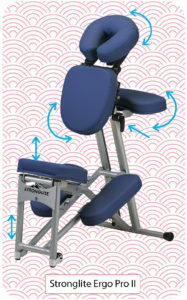 It is the most adjustable chair and that quickly fits to the customer and the practitioner. There is no uncomfortable brace between the legs. It sets up fast and folds quickly into a compact case. It has exclusive features, such as complete removal of the leg rests for people with problem knees, and a swiveling chest pad to make room for the “Buddha” bellies. TouchPro has the guaranteed lowest price for the Ergo Pro in our store plus free shipping in the continental USA. Check it out here. You can save even more by signing up for the Online Chair Massage Training and you will get an extra discount coupon for $20.